As pioneers of third wave coffee in Kelowna we are dedicated to selecting, roasting and preparing coffee that is exceptional. Our coffee journey began in 2002 with ownership of the iconic Bernard Avenue location and the knowledge we could do better. We overhauled all aspects of production. Espresso was returned to the top of the heap and drink size was decreased to offer smaller, traditional coffee drinks featuring latte art. We opened our own roasting company. Coffee is roasted by hand, in small batches and on demand. Green coffee is meticulously selected and roasted to showcase its unique origin profile. Our veteran 12 kg Probat coffee roaster was retro-fitted with an emission control system that decreases 1.2 million BTU per hour from our roasting process. Baristas were offered intensive and ongoing education, then given the freedom to chase quality. 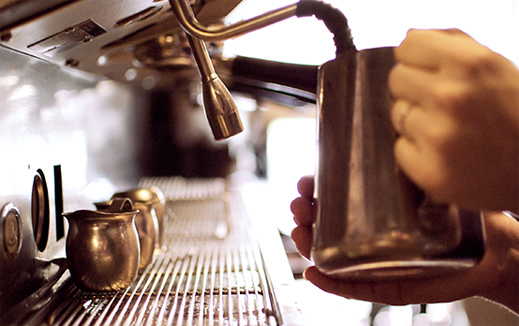 Baristas have shaped the coffee we offer today through their dedication and innovation. To promote excellence we provide a competition fund for our baristas to attend international competitions. Today? The perfect shot is out there – we’re still chasing it.